The Infiniti FX SUV will cost from £42,600 when it goes on sale in September. The FX is already the best-selling Infiniti vehicle out of the range across Europe. The base FX37 GT is powered by a 316bhp V6 petrol engine which accelerates from 0-62mph in 6.8sec and has a top speed of 145mph. It has 266lb ft of pulling power and averages 23.4mpg, whilst spewing out 282g/km of CO2. A 7-speed semi-automatic gearbox is fitted as standard. The mid-range FX37S costs from £44,600. For the additional £2,000 buyers get Continuous Damping Control, electrically-adjustable driver's seat, sports front seats, 21-inch alloy wheels, performance tyres and a dark chrome exterior trim. The range-topping FX50S will cost from £53,800. That £9,200 premium over the FX37S adds a 385bhp 5.0 litre V8 petrol engine, rear active steering, 360 degree cameras, cruise control, intelligent brake assist and a tyre pressure monitoring system. 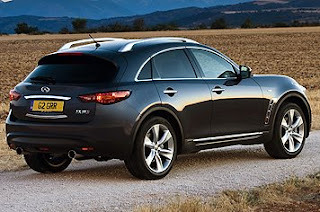 The V8 has 369lb ft of torque, accelerating the FX50 from 0-62mph in 5.8sec and on to a limited top speed of 155mph. It averages 21.7mpg and produces 310g/km of CO2. Buyers also get Infiniti's Connectiviti+ package as standard, which includes a 30GB hard disk sat-nav, 8" touchscreen display, 10GB of music storage and a DVD player. Other options for the FX range include 360 degree cameras at £850, a sat-nav system at £1,700 and a Bose sound system for £600. Infiniti also says that it will offer customers an unrivalled sales experience. It describes its showrooms as having "the ambiance of a boutique hotel rather than a traditional car showroom." The first Infiniti Centre will open in Reading in September, and 12 in total are expected to open over the next two years. Customers will be able to have their cars picked up and serviced once a year, provided they live within 150 miles of a Centre.